The record is made up of 1 volume (257 folios). It was created in 3 Aug 1912-27 Dec 1918. It was written in English and Arabic. The original is part of the British Library: India Office The department of the British Government to which the Government of India reported between 1858 and 1947. The successor to the Court of Directors. Records and Private Papers. This volume primarily concerns the preparation and submission of annual trade reports. 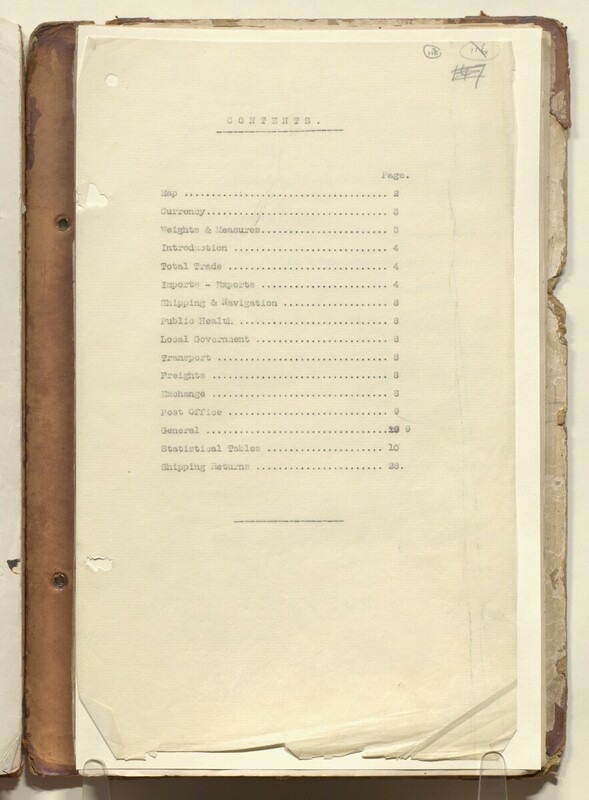 Most of the volume consists of copies of trade reports for Kuwait (for each financial year from 1912-1913 up to and including 1916-1917), which are submitted by the Political Agent A mid-ranking political representative (equivalent to a Consul) from the diplomatic corps of the Government of India or one of its subordinate provincial governments, in charge of a Political Agency. , Kuwait (Captain William Henry Irvine Shakespear; Lieutenant-Colonel William George Grey; Major Robert Edward Archibald Hamilton). Imports include arms and ammunition, rice, specie [coins], and sugar; exports include pearls, specie and tea. Each report records the total value (initially in rupees but later in sterling) of the trade for the year and discusses in detail the increase and decrease in trade of specific goods. Further items of discussion in later reports include public health, shipping and navigation, and transport. Each report also includes in its tables of statistics the corresponding data (i.e. quantities and values of goods) for the two preceding financial years, as well as the countries from/to which the principal articles were imported/exported. The rear of the volume contains some trade statistics for the financial year of 1917-1918. In addition to trade reports, the volume includes correspondence between the Political Agent A mid-ranking political representative (equivalent to a Consul) from the diplomatic corps of the Government of India or one of its subordinate provincial governments, in charge of a Political Agency. and the British Residency A diplomatic office of the British Government established in the provinces and regions considered part of, or under the influence of, British India. at Bushire regarding occurrences of 'double entry' in the shipping returns of Persian Gulf Historically used by the British to refer to the sea area between the Arabian Peninsula and Iran. Often referred to as The Gulf or the Arabian Gulf. ports. The Political Agent A mid-ranking political representative (equivalent to a Consul) from the diplomatic corps of the Government of India or one of its subordinate provincial governments, in charge of a Political Agency. is instructed to include in his returns only those vessels that either bring cargo to Kuwait from outside the Gulf or depart with cargo taken from Kuwait which is destined for somewhere outside the Gulf. a request, dated 20 January 1917, from the Chief Political Officer, Basrah (Lieutenant-Colonel Percy Zachariah Cox), for the Political Agent A mid-ranking political representative (equivalent to a Consul) from the diplomatic corps of the Government of India or one of its subordinate provincial governments, in charge of a Political Agency. to provide information regarding British and foreign trade at Kuwait, in order to assist a commission that has been appointed to enquire into the condition of British trade with Mesopotamia and the Gulf ports (the file includes a copy of instructions for the commission). The Arabic material in this volume consists of three items of correspondence. The papers are arranged in approximate chronological order from the front to the rear of the volume. Foliation: the main foliation sequence (used for referencing) commences at the front cover with 1, and terminates at the inside back cover with 259; these numbers are written in pencil, are circled, and are located in the top right corner of the recto The front of a sheet of paper or leaf, often abbreviated to 'r'. side of each folio. Additional foliation sequences are also present in parallel between ff 3-258; these numbers are also written in pencil, are sometimes crossed out, but are not circled. A previous foliation sequence, which is also circled, has been superseded and therefore crossed out.